Q: Won't people steal the books? A: No. 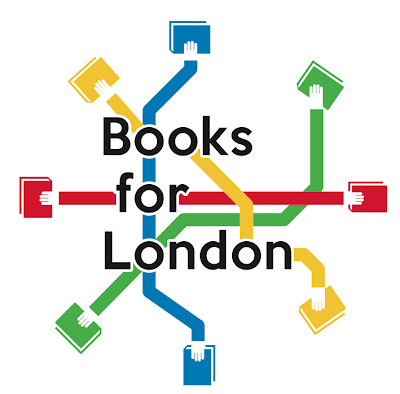 You can't steal a free book. 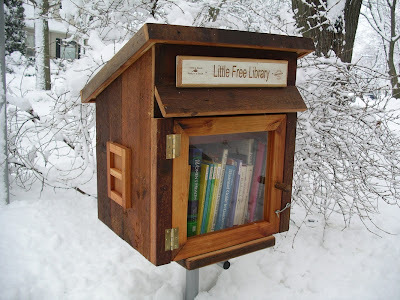 I've been reading about a number of other book swapping and mini-library ideas, too. British Telecom has an Adopt a Kiosk program, and some communities are turning these phoneboxes into little libraries. 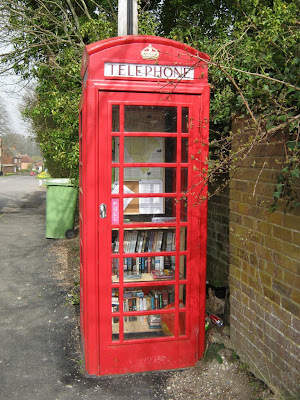 As photographer John Spooner noted about this one in Barton Stacey: "It may not have many books, but it is open 24 hours a day, 365 days a year." [photo licensed under Creative Commons] You can read about the one in Somerset, with space for 100 books and DVDs, where "residents line up to swap their already read books for new ones left by other patrons." 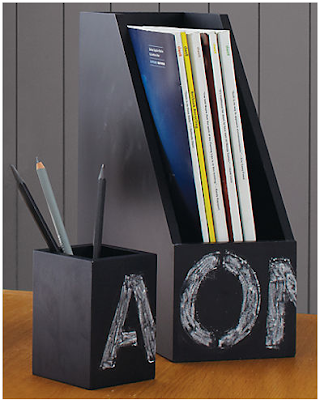 And the good old office (or other workplace) book swap is still a great idea. 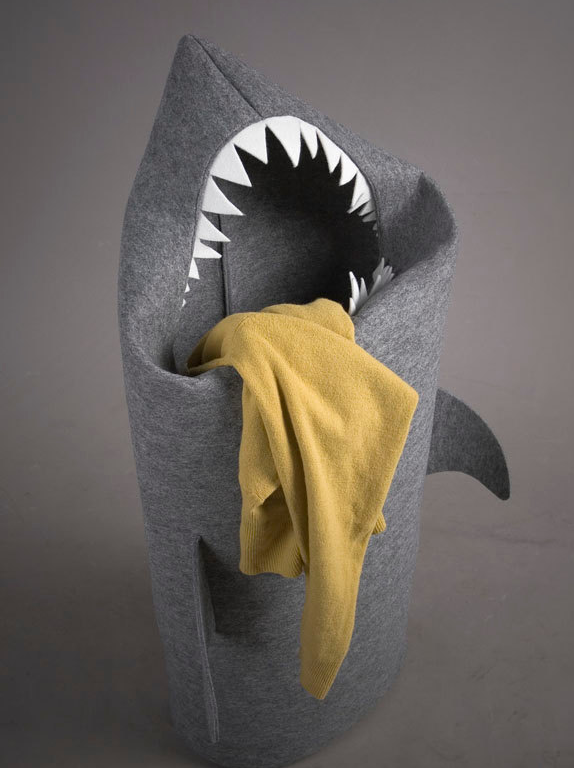 Not into sharks? Papatotoro has a number of lovely hand-printed linen hampers with leather handles. Want something simpler? 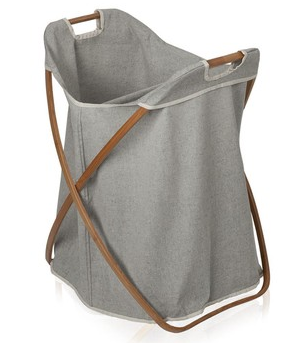 Here's a canvas and bamboo laundry basket from Moeve, in a single or double style. You can find them both at Amara. 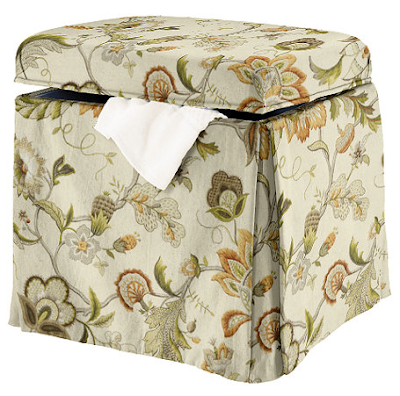 And for fans of dual-purpose furniture, here's a hamper stool from Ballard Designs. It comes in a wide range of fabrics, both patterns and solid colors. Yesterday I saw the following tweet from Erin Doland: "Idea for unitasker I'd buy: a pony tail holder dispenser for your car/desk." Reading this, I wondered: Does anyone make a pony tail holder dispenser? I went looking, and I couldn't find one. But Erin's lament is a common one. Whether you call them pony tail holders, hair elastics, hairbands, hair ties or something else, they sure do seem to wind up all over the place. And while there are many ways they could be stored — small bowls or baskets, zippered pouches, magnetic tins, over-the-door shoe organizers, etc. — the one suggestion I found most often was to store them on a carabiner. That's what Kim of Hippie Hugger did. Jilly did the same. So they sort of create their own dispensers. And some people, like Deanna, do the same sort of thing with shower curtain rings. One more thought: Would a hairband ball count as a dispenser? 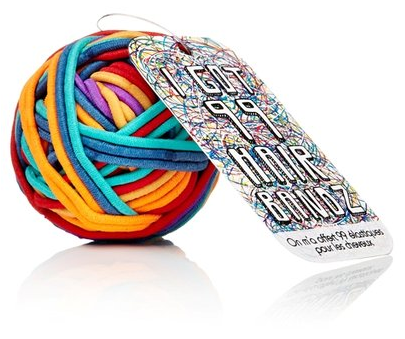 This is the 99 Hairbandz from NPW, available from Tigertree. 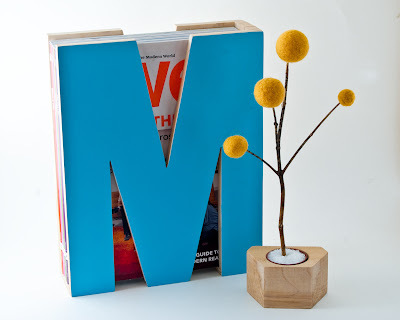 M is for Magazine, as Jimmie of Up Till Now would like to remind you. If you have a treasured magazine collection, and want to show off some of those magazines — or keep a few close at hand — this might be a fine way to do so. Want to store those magazines in acid-free and lignin-free file holders? Hollinger Metal Edge has the products for you. 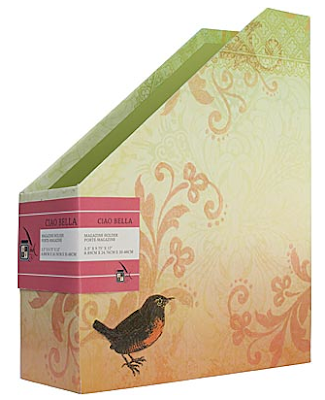 These magazine files, sold by the Green Stationery Company, are "made from sustainably-sourced beech from Germany." I also found a German site selling what seems to be the same product. And if you prefer the cardboard variety, take a look at the magazine holders from DCWV Ink, some of which can be found at My Pretty Office. 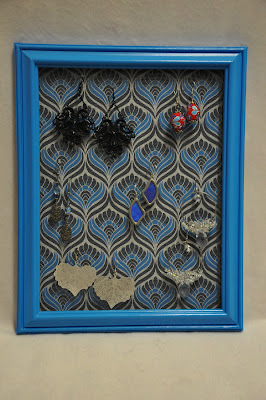 And finally, there are the magazine holders from Punch Studio, sold by Crystal Griffin Home (via Amazon) and Touch of Europe. Of course, another way to manage the magazines is to decide you don't need many of them — and either recycle them or find them new homes. I use Freecycle a lot. I'm sure that, over the years, I've gotten rid of thousands of things using my local Freecycle group. Just this past Sunday, I found new homes for 40 CDs, 14 DVDs and 7 VHS tapes. How do I do it? Like this! 1. Group the things to be Freecycled. It's good manners — and more efficient for all concerned — if similar things are grouped in one post. So when I have a bunch of things to Freecycle, the first thing I do is put like with like. 2. If it's a seasonal item, stash it away for Freecycling later. I have boxes in my garage of things to Freecycle at Halloween, Thanksgiving, Christmas, etc. Things that no one wants in April can go in no time as the holidays approach. Fortunately, I have plenty of room to store a few boxes like this. 3. Determine how best to describe the items. Some things are straightforward. A DVD of a well-know movie needs nothing more than the title. For lesser-known items easily found on the web, I'll include a link with my post. That works for books, CDs, DVDs, and many brand-name items. But for some things, only a photo will do. I use my digital camera, upload the photos to Flickr, and include a link in my Freecycle post. If something is flawed, I make sure to get a photo that shows the flaw. And, of course, listing dimensions helps for many things. 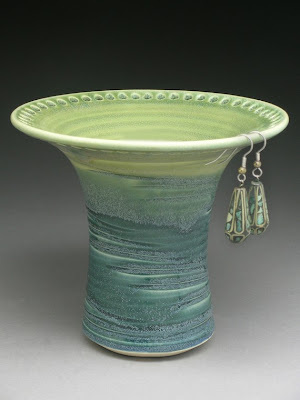 How tall is that vase? 4. Respond to requests, deciding who to give things to. If multiple people ask for the same thing, I'll decide between them partly based on the person's history with me. Yes, I do keep track of that. I file the e-mails from people I've given things to into one of two folders: the one for reliable Freecyclers or the one for unreliable Freecyclers. Then when someone asks for a new item, I can search my messages to quickly see if I've given to the person before, and how reliable the person has been. Which folder are the person's messages in? The vast majority of people in my Freecycle group are very good about picking things up, but it seems every groups has a few flaky people. But flakiness can also be fluid; one of my least reliable recipients in years past has changed into someone who is extremely reliable now. 5. Package up the things being taken. 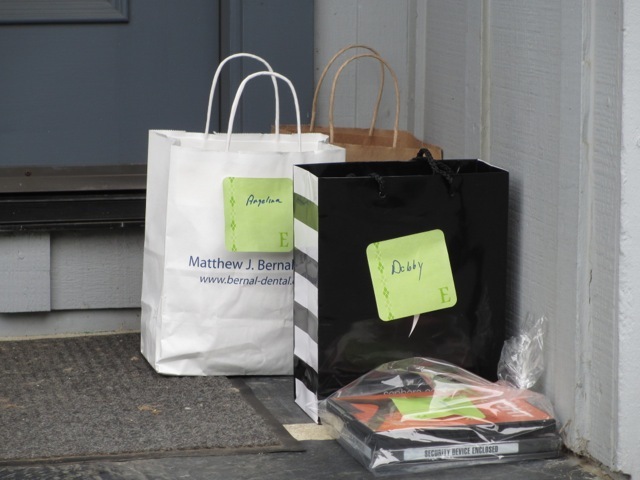 If someone is getting just one thing, I'll just put a sticky note on the item with the person's name — unless the weather is bad, and I need to put things in plastic bags for protection. If someone is getting multiple things, I'll put them in a bag or box with the person's name on it. If things are being picked up over a number of days, I'll make notes on my calendar as to who is picking up on which days, so I don't forget to set things on my porch on the appropriate days. I do all of this right away — as soon as I've said yes to someone's request — so I don't lose track of who's getting what, and when. 6. Let people know things are taken. On Flickr, I'll add a TAKEN note on things that have been claimed. And I also send out the appropriate TAKEN messages on Freecycle itself. 7. Follow up on any pickups that don't happen. I have a "Freecycle - waiting for" e-mail folder. If something stays on my front porch past the expected pickup time, I'll go into that folder and send a reminder message. If I don't hear back after a day or two, I'll re-offer the items to the group. 8. Send along thank-you notes to my clients. This is my favorite part! Recipients often send thank-you e-mails, and I like to forward these along to my clients — after deleting the recipients' names and e-mail addresses. My clients love hearing about how their things found perfect new homes: the old VHS tape of a movie going to someone who loved that movie; the school supplies going to a grateful teacher; the books that will never be re-read going to new people who will read them; the unloved vase going to someone who deems it beautiful. And I understand that reaction; I feel exactly the same way when the Freecycle items happen to be my own, rather than a client's. Yes, Freecycling can be much more work than dropping things off at Goodwill or the local charity thrift store. (And I do use both of those for certain types of things.) But, in many cases, Freecycling is also more rewarding. And, by now, I have it down to a science. Shall I keep this trophy? This memento? This whatever-it-is from my past? Usually, deep down, we know the answer. So I encourage people to pay attention to their instincts and listen to their hearts. Do what's right for you. If you glow when you talk about a certain possession, it's probably something you want to keep. If it brings up bad memories and associations, you probably want to let it go. You don't need to keep the wedding dress from the marriage that ended bitterly. You can get rid of the yearbooks if high school was a nightmare. But what do you do about something that was a cherished possession, representing hard-won achievement and many good memories — and then that item becomes tarnished? I've let go of books I enjoyed when I found the author held beliefs that not only didn't mesh with mine, but left me horrified. Every time I saw those books on my bookshelf, they reminded me of the author's reprehensible positions. But that was easy. Some Eagle Scouts have recently made much harder decisions: They've turned in their badges, medals and other Eagle Scout items because they believe the Boy Scouts of America, in "excluding individuals — both youth Scouts and parent leaders — who identify as gay or lesbian," have violated the core principles they learned during their scouting years. A collection of letters, which can be found at Eagle Scouts Returning Our Badges, shows how difficult a decision this was for each scout who chose to return his badge. 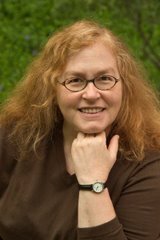 The silver eagle on my badge has been my constant companion on a chain around my neck every day for the past forty five years. I will miss it terribly, but I will not miss the organization it now represents, one that discriminates against individuals based on factors beyond their control. As proud as I am to have earned my Eagle Scout badge, I can stand prouder to have returned it. 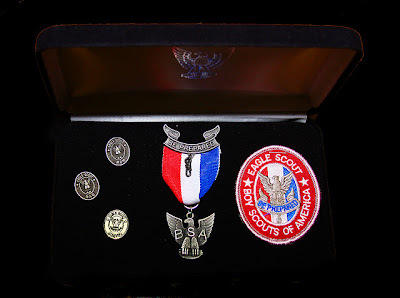 It is with great sadness that I, after 50 years, must take down my Eagle Scout Medal from my wall and return it to you. I cannot support an organization that does not live up to the standards it purports to teach. I have been a Scoutmaster, Assistant Scoutmaster, and merit badge instructor. My father, my two uncles, my older and younger brothers are all Eagle Scouts. I was raised on scouting. Through scouting I was taught to do my duty to God and my country, no matter what the cost. So it is without hesitation that I perform my moral obligation and rescind my rank of Eagle Scout in an act of protest against the BSA’s homosexual policy. I take no pleasure in writing this letter, or in renouncing my membership and Eagle Scout Award. In fact it pains me to the very foundation of my being. I know, however, that my pain is insignificant compared to that of some innocent kid who only wants to better himself and his community through Scouting. A kid who is probably rejected at home, rejected at school, and rejected at church – a kid who needs scouting more than I did. And still today, he will find no solace in The Boy Scouts of America. He will be denied the benefits of brotherhood, the satisfaction of achievement, and the lifelong rewards of Scouting. He will be denied all of the things that I have gained simply because I was born a straight man, and he was not. And the letters go on and on. Obviously, this will not be the choice every Eagle Scout makes. It's a very personal decision. If you're an Eagle Scout, do what's right for you. When Gail Blanke tells you to throw out 50 things, she doesn't mean 50 of those old magazines. Those just count as one thing. But she also includes things you might not think of. Once you start throwing out a lot of physical clutter — once you get on a roll, and you will — a new urge kicks in: "What about all the clutter in my mind?" you ask. "What in the world have I allowed to collect there?" And then you get into the really good stuff. Blanke guides you through both the physical and the mental clutter, saying, "In addition to the socks and lipsticks, you're going to throw out the old regrets and resentments" — and so much more. We really are what we think about. And what we surround ourselves with influences a lot of our thinking — even if it's stashed away up in the attic. While the room-by-room chapters are good, the chapters dealing with the mental clutter are my favorite parts of this book. For example, there's the lovely chapter about Letting Go of the Type of Person You Think You Are — or Aren't. Not a morning person? You can decide that you are — and make that happen. (And as someone who generally thinks of herself as "not a morning person," Blanke's suggestions here made sense to me.) Whether you're "not the type to get up in front of people and talk" or "not the creative type" or whatever, you can choose to let go of that typing if it doesn't serve you. We've all messed up. We all have those middle-of-the-night moments (hours?) when we castigate ourselves for not knowing better, for not seeing it coming, for not trying harder, for not standing up for ourselves — or not keeping quiet for once, if that's what the retrospect suggests. For not being perfect. But perfectionism, like martyrdom, is highly overrated. I don't agree with everything in this book; for example, I don't think the answer about whether to keep something you're unsure about is aways to get rid of it. But this was an enjoyable read, filled with anecdotes from the author's own life and those of her clients — and filled with much wisdom. 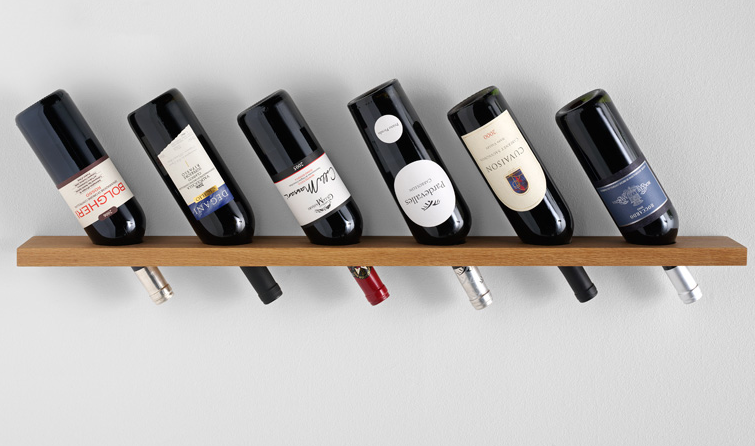 Where to Store the Wine? Try the Wall! Looking to create more storage space for your wine? Consider looking to your walls! 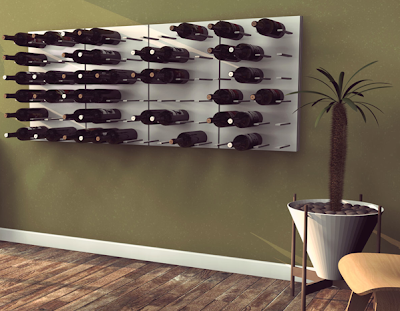 There are many wall-mounted wine racks to choose from; let's start with this one from the Italian company Calligaris, sold here and through many other web sites. Another Italian design is the Entoca wine rack from Legnoart, which is sold by Gessato. 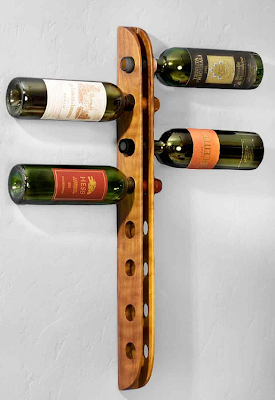 If you'd prefer to support an individual craftsman, you might like this wine rack from Piser Designs, also sold by Sawbridge Studios. Another one to consider is the Winescape from Paul Allen Design. Want a splash of color? Here's the Waves wine rack, from the Sunset Collective. This is Vineyard, from Pack & Rack; it comes in three different woods. 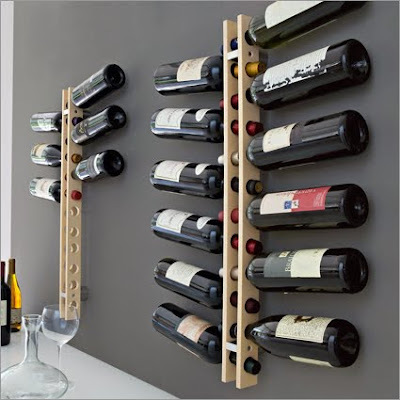 Of course, when selecting where to place these racks, you'll want to follow the basics of good wine storage, keeping the wine cool and away from any sunlight. Still like to use an alarm clock, rather than just using the alarm on your phone? 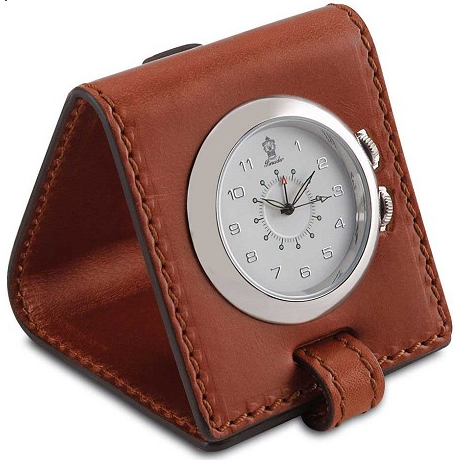 There must be plenty of us, because I keep finding some nice alarm clocks to show you. As Seth Simonds writes on Lifehack, "Don’t use an alarm that makes you angry." 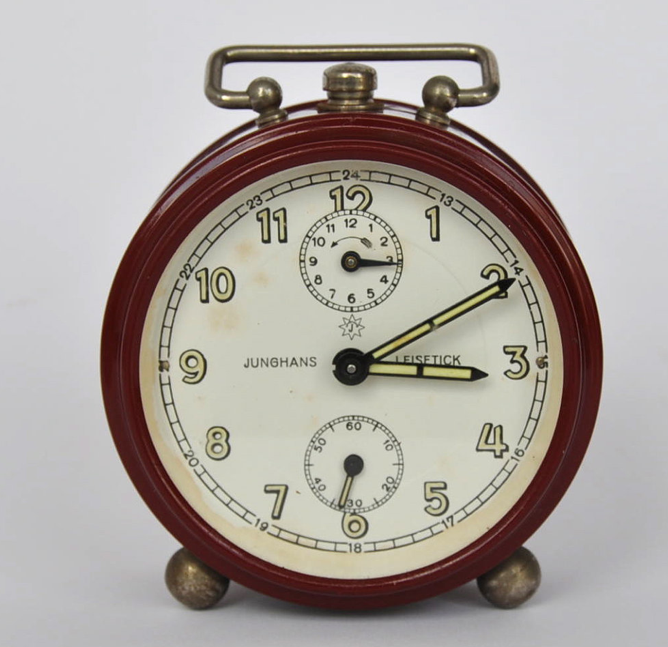 If your current alarm clock isn't working for you, here are some to consider. 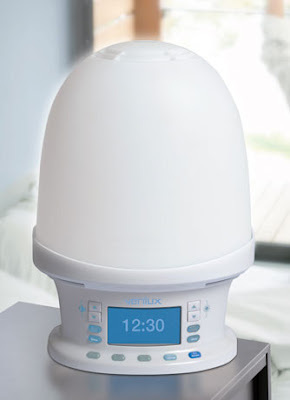 If you'd like a calmer way to start your day, take a look at the Verilux Rise & Shine Natural Wake-Up Light. The light gets progressively brighter over a 15-minute period; there's also a sound alarm, with a choice of natural sounds combined with music — "pond life harmony" and "songbird serenade" are two options — or the clock radio. You can buy this from Signals as well as directly from Verilux. 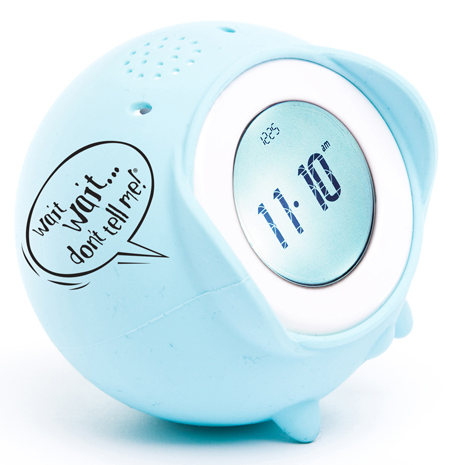 Want just a normal alarm clock — but one with style? 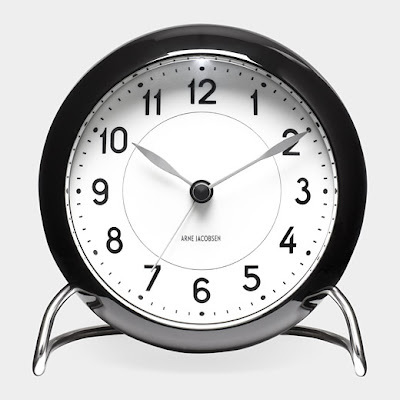 The Arne Jacobsen alarm clocks from Rosendahl are worth a look. You can buy these clocks at the Scandinavian Design Center; the Station alarm clock, shown above, is also sold at the MoMA Store. 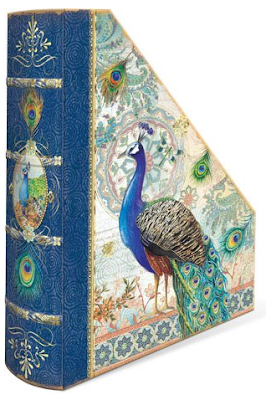 Let's end with this gorgeous — and expensive — travel alarm clock from Pineider, sold by Pianki. 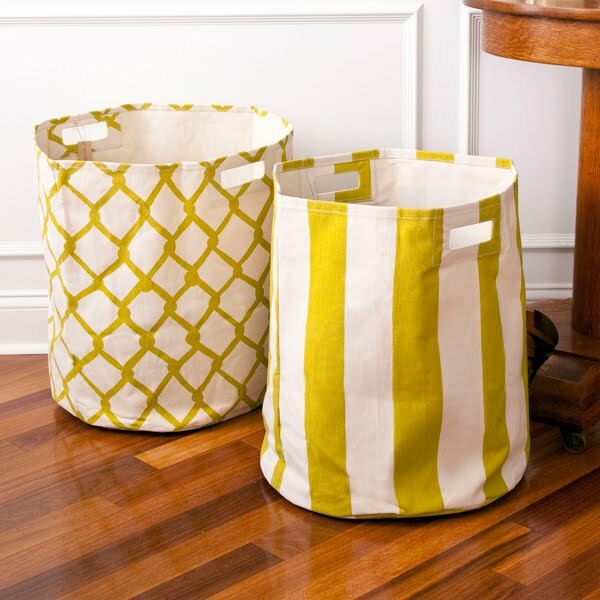 Plastic has its place — but sometimes you want storage containers with more pizazz, and fabric baskets can provide that. 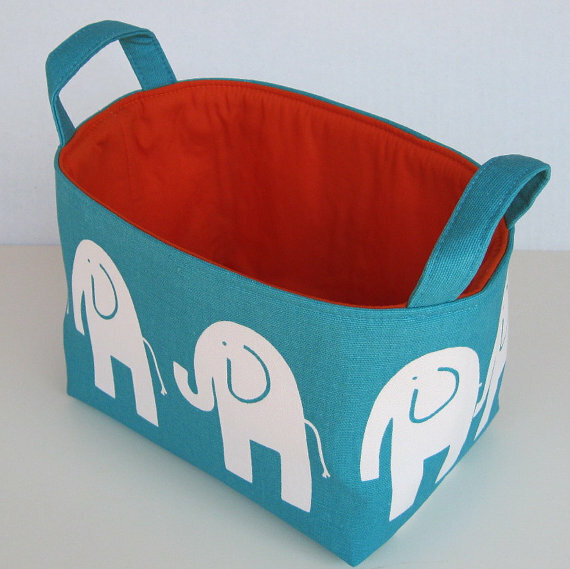 I've mentioned Baffin Bags before, as a source of Easter baskets and Halloween trick-or-treat buckets, but you can also find fun things like these elephant-themed fabric baskets, which come in a range of colors. Not into elephants? How about birds? 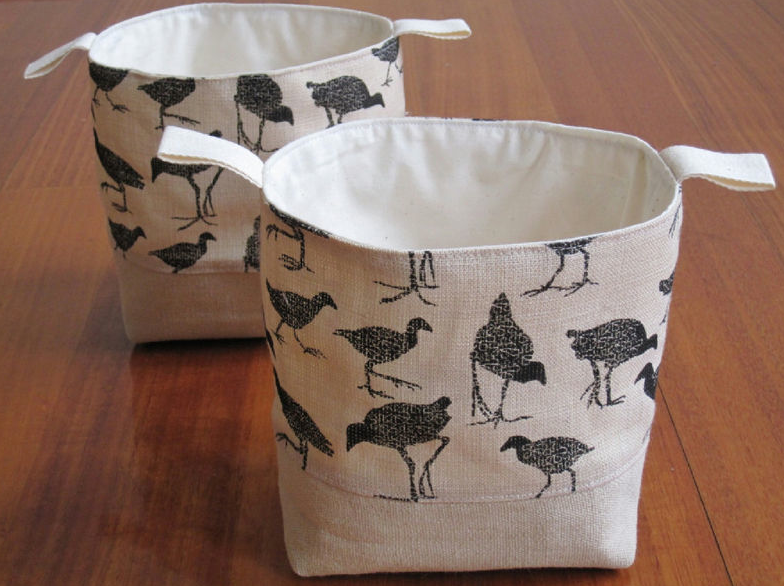 You can buy these fabric baskets from Antipodean Love, which tells us the bird is "the Pukeko, or Purple Swamphen, which is found throughout New Zealand." 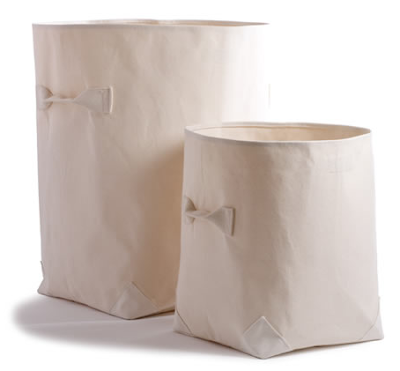 LinenLifeN makes linen storage baskets with waterproof linings. Many of the designs are based on the flags of various countries: Argentina, Brazil, Canada, France, Germany, Greece, the USA, and more. Update on June 5, 2013: I'm no longer finding this Etsy shop. HomeSweet makes block printed fabric buckets; the outer fabric is hemp and the lining is hemp and organic cotton. 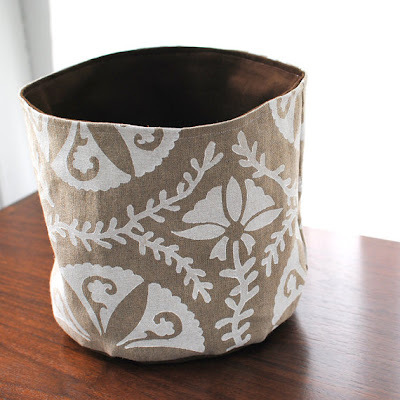 Shop owner Jennifer Nelson says her fabric buckets "are created in batches from fabric remnants that accumulate in the studio. 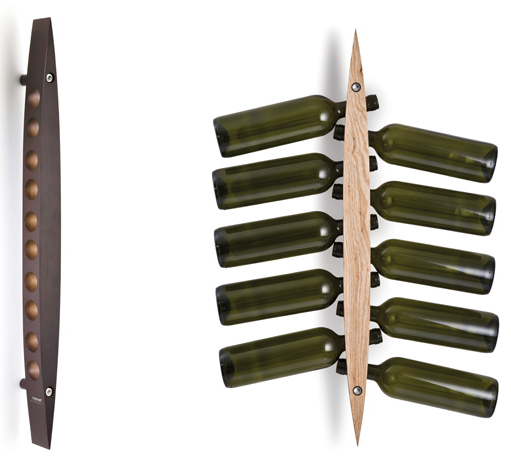 It's such a pretty way to reduce wasted materials!" 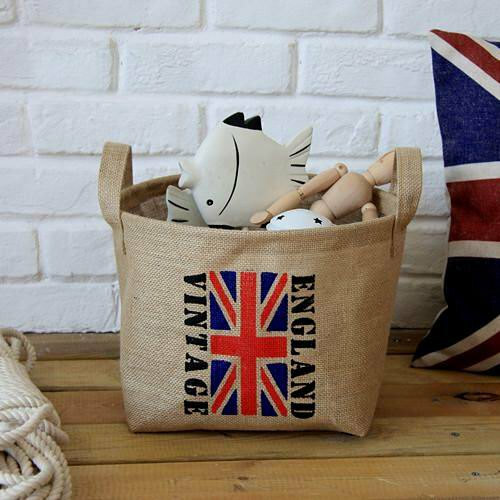 [via High Street Market] Update on June 5, 2013: There are no fabric buckets for sale by HomeSweet right now. Finally, if you need some larger storage, take a look at the canvas baskets from Pehr Designs, also available at See Jane Work. Or you could buy a lovely earring organizer from Joanna Price of Mirkwood Mercantile — made from a recycled picture frame, decorative paper for the backing, and fiberglass mesh. 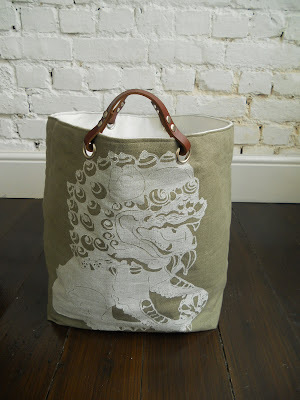 Joanna has a number of other designs available, too. 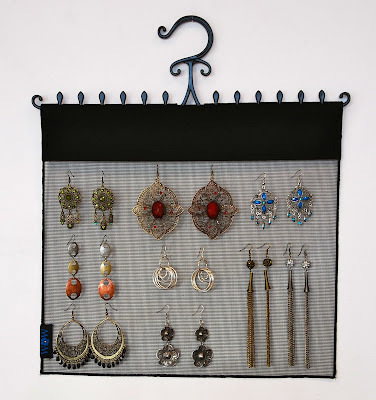 The WOW earring organizer also uses the mesh idea — but unlike the others, this organizer could hang in your closet. Of course, you don't need to go with mesh. 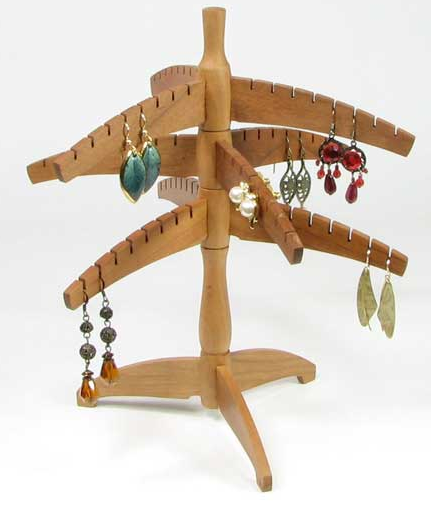 Here's a lovely earring tree from Barclay Fine Woodworking. This is the 36-pair size; there are also smaller trees, to hold either 16 or 24 pairs — and larger ones, to hold 48 or 60 pairs. 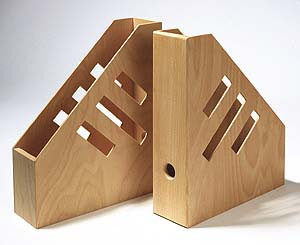 The trees are available in cherry, walnut and curly maple. 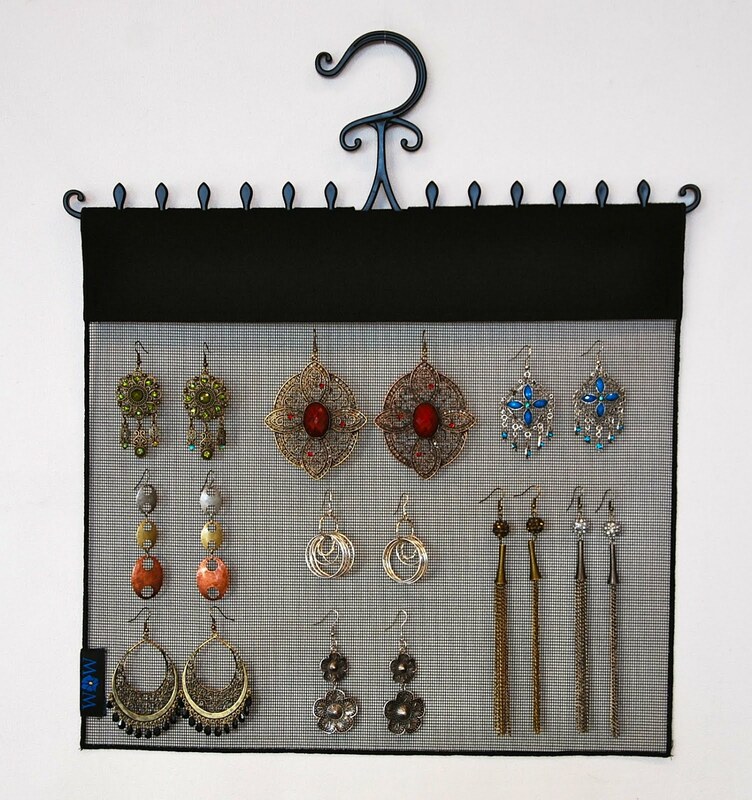 So many earring racks are made of wood — and while I love wood, it was also nice to see this one made of steel, from Reed Creek Welding. 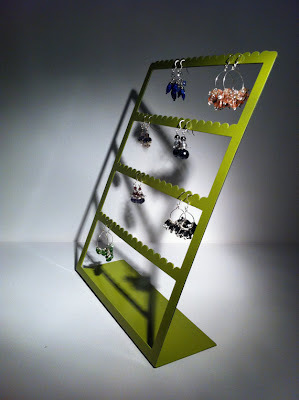 It holds 32 pairs of earrings, and comes in 15 different colors — and can also be made with one color fading into another. For a very different look, you could get a ceramic earring holder from Barbara Lund; these holders come in a wide range of colors, and have 50 holes. 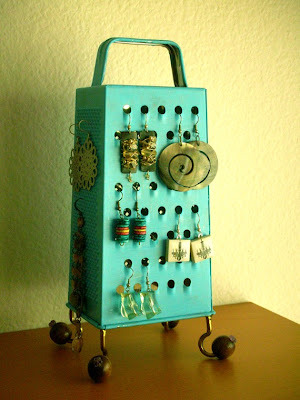 And finally, I just had to show you the earring stands made from cheese graters. Souvenir T-shirts can be hard to let go of — even when we have way too many of them. 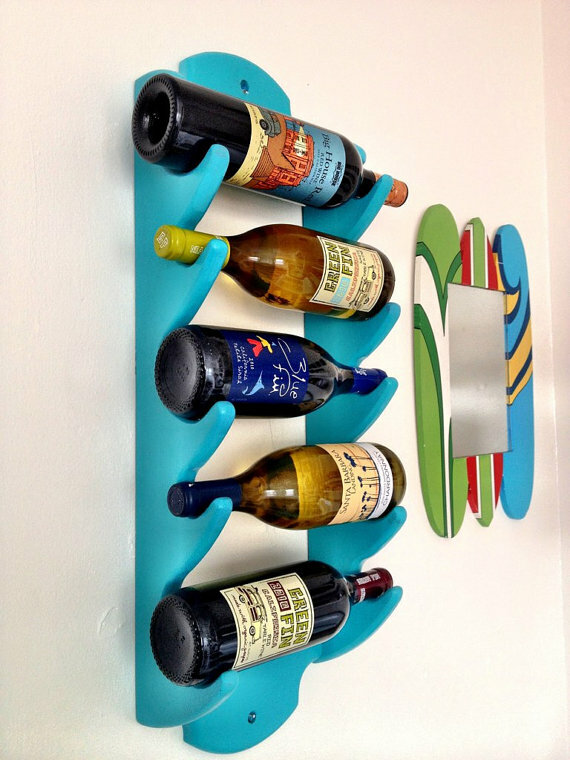 You could just take photos of them and then give them away — or you could repurpose some. 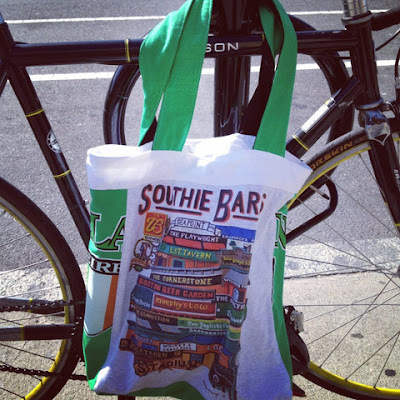 A number of companies will turn your old T-shirts into T-shirt quilts for you, but another option is turn them into some sort of tote bag. If you aren't handy enough (or don't have time enough) to do this yourself, there are companies that can help. Are you a racer of some sort: runner, swimmer, cyclist, etc.? Have a collection of both T-shirts and race numbers? Races R My Bag can turn these into custom bags of various styles and sizes. 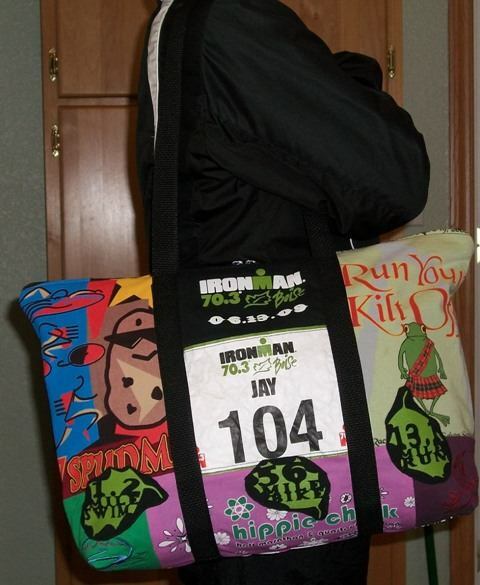 Most require both T-shirts and race numbers, but there's also one that's made from T-shirts only.